Under the banner “Innovation is the key to our future”, the Radiological Society of North America (RSNA) has just concluded its 101st consecutive meeting in Chicago Over forty thousand delegates – radiologists, physicists, radiographers, sales representatives and business executives – converged on McCormick Place in the Windy City to learn about the latest developments in medical imaging. For breast cancer detection and treatment, the theme that characterized the meeting was 3D: seeing structures in three dimensions. Perhaps the most interesting example was 3D printing with a range of vendors – including Materialise, 3D Systems and Stratasys – demonstrating what was possible. Tatania Kelil presented a poster in which she showed how computed tomography (CT) imaging and 3D printing could be combined to improve breast reconstruction. One surgical technique involves an autologous graft in which the patient’s own tissue – a flap of skin, fat and sometimes muscle – is excised from the abdomen and reattached to the chest. 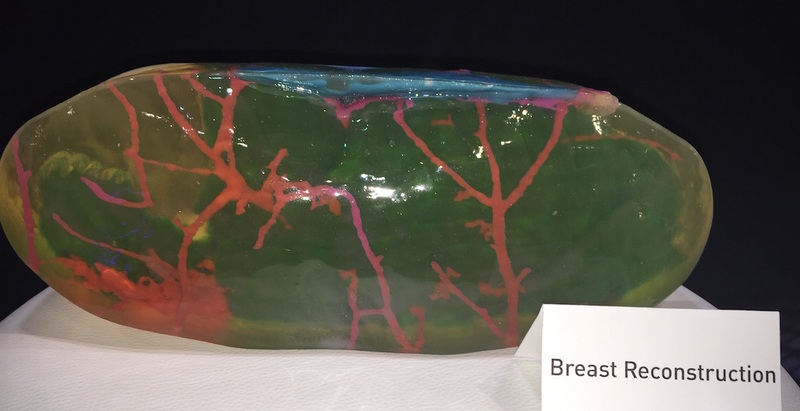 A 3D-printed model of the flap (seen above) enables the breast surgeon to identify the location of the dominant blood vessels and plan the surgery accordingly. Academic interest in breast cancer detection was such that many of the presentations were delivered in the Arie Crown Theater, a huge auditorium with seating capacity for 4,250 people. Emily Conant, chief of breast imaging at the University of Pennsylvania, reported that digital breast tomosynthesis (DBT) may, over time, detect more cancers, and more clinically significant tumours, than full-field digital mammography (FFDM) alone. However, as shown by Jung Min Chang of Seoul, Korea, DBT still misses some cancers in women with dense breast tissue, and so hand-held or 3D automated breast ultrasound (ABUS) is required to diagnose these cancers. The market leader in DBT is Hologic who punted its Genius 3D system, and Hologic was joined by Siemens, GE, Fuji and Planmed. The Italian company IMS demonstrated its Giotto DBT system that has the unique ability to pivot through 90 degrees and facilitate 3D stereotactic biopsy with the patient lying prone on a bed (see photo left). 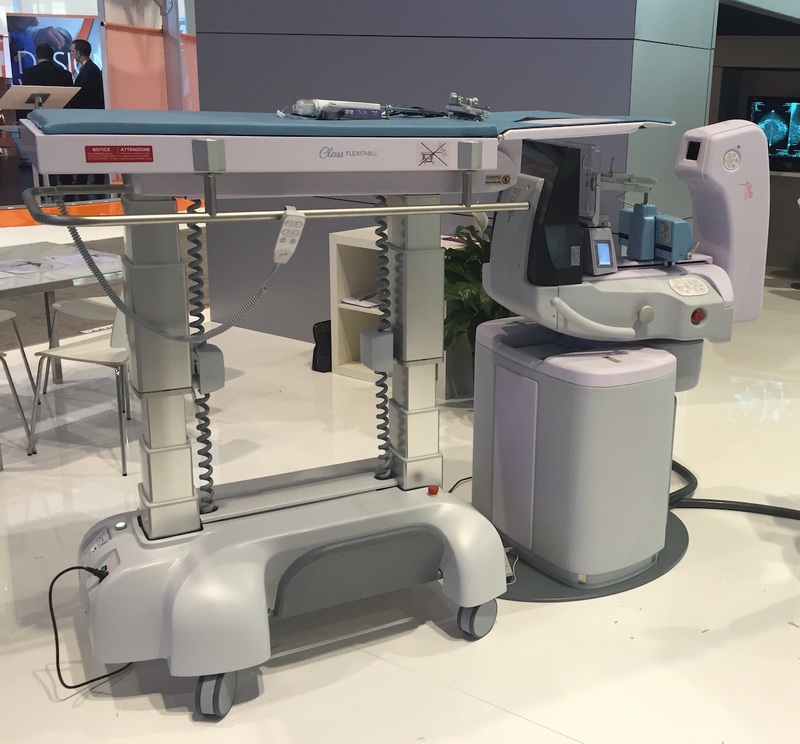 Koning launched Breast CT at RSNA2015, installing their system in a large mobile van, while CT Imaging of Germany debuted their dedicated solution that offers spatial resolution of 0.1 mm and will be undergoing clinical trials in early 2016. Not to be outdone, there were also ABUS products on show from GE, Siemens, SonoCiné and Delphinus. It’s clear: as the new century dawns for RSNA, 3D imaging of the breast will be the wave of the future. I enjoy your blog and had hoped to meet you at RSNA but spending 5 days there is like drinking from a firehouse. I thought your breast summary of the meeting was on point. which was combining US & FFDM. I left Fischer to start a new company (www.intio.us) and unfortunately those who followed seized defeat from the jaws of victory and never proceeded with the system. I am pleased to see your work as this technology will enable screening to proceed more efficiently and women will benefit from reduced recall and increased cancer detection. I also am on the board of Sonocine and responsible for bringing the GIOTTO systems to the US market so glad to see you included mention in your summary. The scale of the conference is mind-boggling. Enjoy!